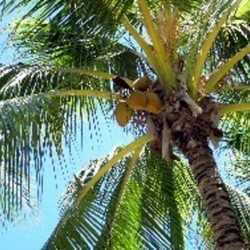 Sometimes referred to as the "tree of life" or the "100 uses tree," Cocos nucifera is not only a common sight of any tropical shore, but indeed a highly useful plant. Let us get a closer look at this marvel of nature. 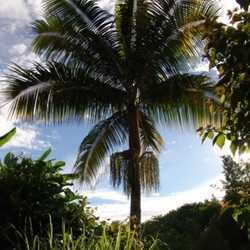 A member of the large Arecaceae (formerly Palmae) or palm trees family which comprises between 2500 and 3500 species divided in over 200 genera, the genus Cocos has only one species but is probably the most widespread of all, growing all over the tropics. 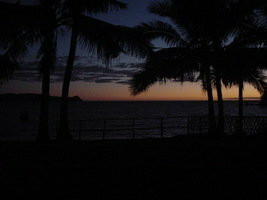 Most scientists agree that it has its origin in the Western Pacific (Melanesia). 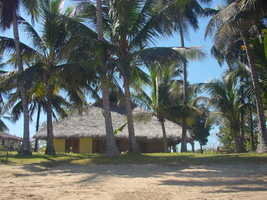 It is a solitary palm (one single trunk), unarmed (no spines) with a quite large crown. The trunk is often curved, with a thickened base, brown to grayish colored, bearing vertical slits and reaching a possible height of 30 meters (90 feet) and about 30 cm (1 foot) in diameter. The leaves (technically called "palms") can reach 6 meters (18 feet) long, with a petiole (leaf stalk) up to one and a half meter (five feet) long. Those leaves are pinnate (divided into 90 to 100 leaflets, or pinna) and the leaflets are 1 meter (3 feet) long. The inflorescence is set on a peduncle up to 1 meter (3 feet) long. It is a monoecious species which means that both male and female flowers are born on the same tree therefore allowing a single plant to produce fruits, as opposed to other palm trees such as the date tree which is dioceous and requires both male and female plants to set fruit. The well-known fruits can be green, yellow or orange and will turn brown when full ripe before falling to the ground; the shape and size depending on the cultivar. Botanically speaking this is a ‘drupe' or fleshy fruit; it is full of liquid albumen called coconut water which will slowly harden and turn into solid albumen known as coconut flesh, coconut meat or copra. This grated and pressed flesh will provide the coconut milk used for cocktails and cooking. Coconut water is a very precious item in tropical areas especially where sanitary levels are low and drinking water unsafe as it is virtually sterile. It is not only free of any germ or bacteria but also very rich in minerals and rather close to human serum which allowed its use for intravenous perfusion during World War Two in the Pacific. It is very thirst-quenching and always fresh due to the thick rind which acts as thermo regulator. This very nut is a highly efficient traveler designed to float on oceans for weeks on without damage and eventually reaching a distant shore where it will be washed up and germinate. The white fresh meat is pretty nutritious with some 40 percent oil, while the dried meat will go up to 65 or even 70 percent, obvious source of coconut oil and by extension soaps and various domestic products. A coconut will take one year between the forming and the ripe stage, then germinating will need 4 to 10 months, the first fruits can appear 5 to 6 years afterwards, full production will be at 15 years old and will start declining when the tree will reach 50 years. An adult tree may yield between 100 and 300 nuts per year depending on climate, variety grown and fertilization.
. Growing requirements for this tree are simple but specific. It needs drained soils and does very well is sandy ones as anyone who has traveled to the Caribbean or Pacific can tell you. In its natural environment, it receives an average annual rainfall of 1000 to 1500 mm, mean temperature between 20 and 27°C (preferably on the higher side.) It will do better when the roots can reach ground water. 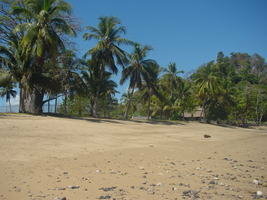 The popular thought that coconut trees need to see the ocean is no more than an idea; it will do very well even far inland provided the soil is adapted and water easily accessible. No need either to sprinkle salt on the soil, as it is sometimes advised. Commercial plantations should not be denser than 200 trees per hectare, so that all of them can benefit from ideal sun exposure - which does reinforce the adage that coconut trees need to have their "feet in water and head in the sun." 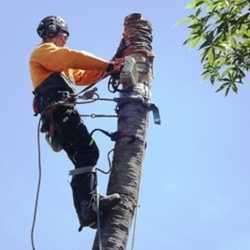 Many tropical countries throughout the world grow the tree and rely on coconut products for domestic uses as well as exporting, the most important in quantity being the Philippines, Indonesia and India. 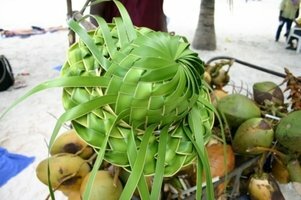 In the Pacific and mostly South Pacific it is also of tremendous importance and some small islands produce very few products other than copra and coconut oil. Besides the obvious use of the meat from the nuts, this tree has many applications which makes it very special. The very hard woody shells can be burnt like wood for cooking or turned into charcoal, alternatively made into a variety of bowls, water or food containers, spoons, or ornamental sculpted items much enjoyed by tourists. The thick fibrous envelope which is found between the outer skin and the shell can be put to use to fill mattresses or turned into ropes or other attachment devices; it is also increasingly used m for potting mixes where it replaces peat moss at a much lower cost and since it is a renewable resource, with much less impact on the environment. 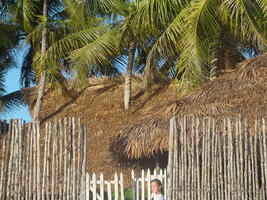 The leaves are like many other palms, often turned into thatching material and also for constructing walls; individual leaflets are woven in a large diversity of bags, hats and mats. The wood itself is used for building; planks can be sawn and polished providing a very decorative effect. Inflorescences can be tapped and the sap either refined to produce sugar or fermented into various alcoholic drinks. 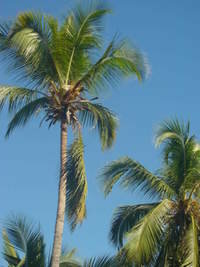 Whenever a coconut tree falls because of cyclone or has to be felled for some reason, the terminal bud is used as palm cabbage. 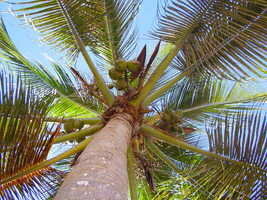 It is much appreciated for its delicate aroma, slightly sweet and very different flavor, compared to other palm species. Not to mention the size it can reach, which will allow it to feed a whole family. Palm trees of the Mascareignes archipelago The Death of a Coconut Tree Co-Co-Coconuts!